As the owner of a construction company looking to expand your reach, you may wonder how your website can bring in more customers. Well, there are many ways, all designed to work in tandem to attract and convert clients. Construction companies are by nature local companies, so you need to be seen by the people in your community that need homes and additions built. Appealing to your target demographic can all be done through SEO, design elements, and local search keywords. However, you need certain basic elements to your construction company website in order to be successful. The key is to tailor your site so that it offers the information users are looking for, points out Mashable. Large High-Quality Photos: Your industry is largely visual. Showing people rather than telling them what you have to offer is key. Compelling content definitely has its place on your website, but photos can speak volumes about what you’re capable of. However, to avoid looking unprofessional, it’s important to incorporate large, high-quality photos of your past work. Professional photos are best, but if that’s not in the budget, make sure you take them with a good camera and at a high resolution. Project Gallery: Once you have the photos, you need to place them somewhere your visitors can easily find. This is why you need a dedicated area to showcase your past and current client projects, with their permission of course. To make the most impact, include before and after pictures with short descriptions of each project. Don’t get too fancy as to overwhelm your readers and slow down loading times. Choose only your best projects, and make sure the photos are vibrant and capture the essence of your work. Testimonials: By the same token, you should include a separate section for the good words of your satisfied clients. In line with positive reviews, testimonials offer insight into what others think of you. According to Search Engine Land, 88% of customers trust online reviews and testimonials as much as personal recommendations. The best way to establish credibility is to give readers evidence that your product or service really works, suggests Entrepreneur. Testimonials from satisfied customers, therefore, will go a long way in explaining how your product or service has helped improve their lives. Include names and towns, and maybe even include a small picture of them beside their statement to personalize their message. This adds credibility to what they’re saying, so don’t be afraid to ask. Services: As a construction company, this is an integral part of your website. You offer a lot of services. Lay them out in a clear navigational path that makes sense. Break them up by Residential or Commercial, for instance. Ideally, you should include separate pages for all your services, from roofing and siding to home renovations and additions. Add compelling content that creatively weaves local keywords into the text so you can be found by local home and business owners. Clear call to action: A killer website is all for naught if you don’t compel people to contact you in some way. You may choose to include an online form they can fill out for more information or a call now button. Perhaps you can incorporate a FREE ESTIMATE button or a link to your contact page. Whatever you choose, it should be bold and at the top of your website — on every page. You may want to test out a few different ways of displaying your call to action. Some may work better than others. Test everything from the placement to the size to the color. Whatever works best, go with it. If you don’t have a clear call to action, your readers will be confused and stop searching for a way to get in touch with you. Make it easy on them and make your call to action big, bold and eye-catching. Your customers want to know your rates, they want to know an estimate of their upcoming project, and they want to know what you do. Don’t make them work for it! 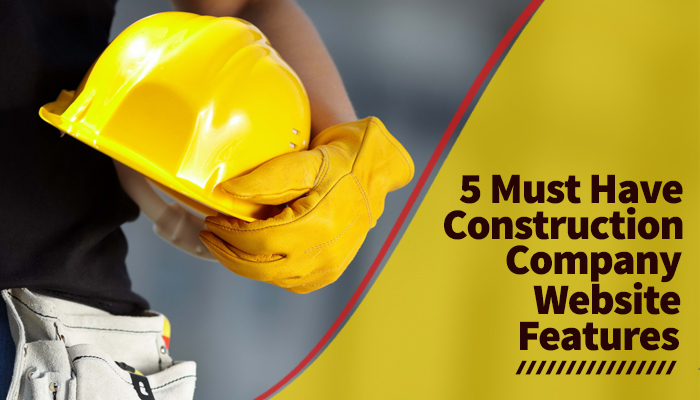 When developing your construction website, make sure all of these crucial elements are incorporated in order to generate and convert leads.